Nancy writes ‘Most of the waterways I’ve visited during my time as Canal Laureate have been wide and well regulated, the behaviour of the water governed by dams and locks, and as dependable as water can be. Their grand character is determined as much by the industrial architecture, by the environment’s users (human and non-human), as by the water itself. But last autumn I had a very different experience on the banks of the River Sprint in the Lake District. Over the spring and summer I had been co-editing a book for the Dark Mountain Project, a compendium of essays and artwork on the theme of Earth, and the consequences of climate change. TERRA had received submissions from around the world, one of which came from this corner of Cumbria. The writer and filmmaker Sarah Thomas, a member of the Dark Mountain team, had written about her relationship with Sprint Mill, and its owners Edward and Romola Acland. Sarah suggested the mill as a location for the book launch, and set in motion a plan to bring the writers and editors, the books and their future readers, to the spot. 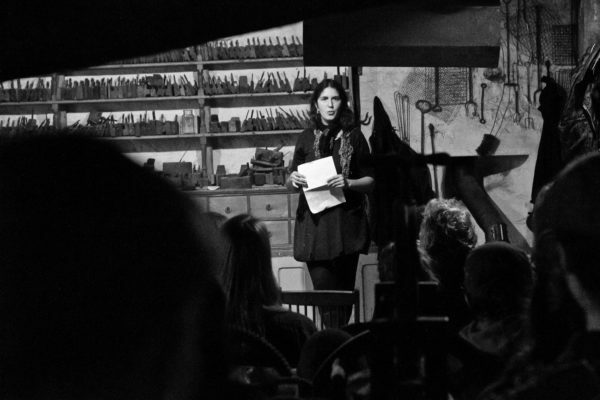 I’d read Sarah’s essay in proof, and was excited to visit this magical setting: a historic 1840 water mill filled with a working collection of antique hand tools. On 13 October Sprint Mill, with its log stove, provided welcome shelter from the storms that had buffeted the region for days. Before the event we admired the River Sprint, which races past the mill and on into the River Kent from its source in the fells. A few hours later, as applause reverberated beneath the old beams, I pulled on my waterproofs and walked back down the muddy track alone, drawn to the waters — the reason the mill had been built here. My boots slithered across the mossy boards of the small bridge. 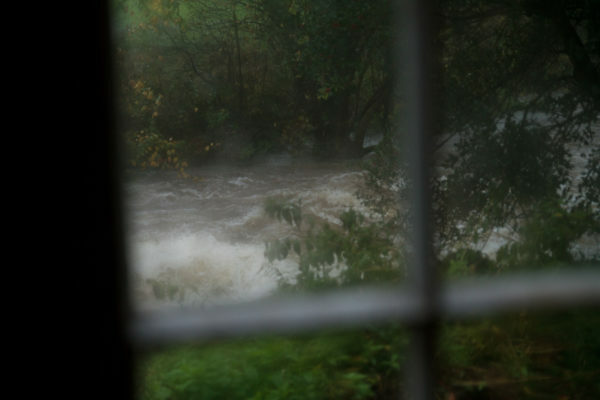 The rain was now abating, but the river rushed beneath me, its surge fed by numerous becks in the hills. Surely the river hadn’t reached the roots of that tree a few hours before? And had the water been quite so thick, and chalky grey, and bounced over the rocks with so much gusto? 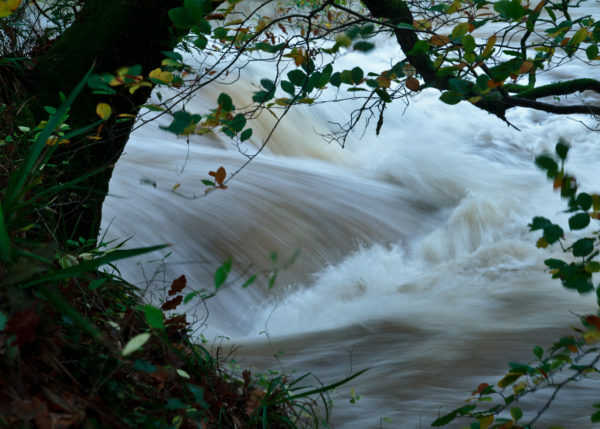 The Sprint has been described as the fastest rising river in England and it lived up to both its name and reputation that afternoon, as the water changed colour and speed and bore broken branches downstream as if they were twigs. 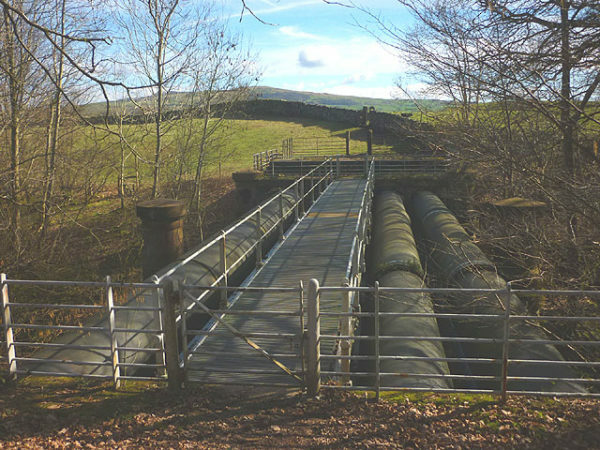 Not far upstream, another bridge crosses the Sprint — pinioned between large iron pipes which carry a very different waterway on a hundred-mile journey from Thirlmere to Manchester. A feat of Victorian engineering, this aqueduct was built over four years by a team of 6,000 men, many equipped with only pickaxes and shovels. The aqueduct was just one of the major changes this enterprise brought to the landscape. At Thirlmere itself, two small lakes, a village and farmland were flooded — the lakes became one huge reservoir. Deciduous trees were felled and replaced by conifers. The reservoir was intended to supply water to Manchester’s factories and workers, but the scheme caused an outcry from both Cumbrian farmers and visitors who considered the Lake District a cultural treasure. The Thirlmere Defence Association was set up in 1877 to oppose the development and protect the waters, fells and peaks made famous by the Romantic poets. Its members included Thomas Carlyle, Matthew Arnold, William Morris and Derwent Coleridge (the poet Samuel Taylor’s son), and the artists Thomas Woolner RA and John Gilbert RA. The media supported them; a Pall Mall Gazette editorial opined that ‘The visible universe was not created merely to supply materials towards the manufacture of shoddy.’ But this early environmental campaign was without success. In 1894, 124 years to the day before my visit to the mill, the waters of Thirlmere had first passed through the iron pipes across the Sprint, and gushed out of the fountain in Albert Square, Manchester. Although Thirlmere Defence Association failed to prevent the development being approved by Parliament, their experience of direct action was not in vain. Three of its principle activists, including the social reformer, Octavia Hill, went on set up The National Trust to preserve and conserve wild spaces accessible for everyone. Thirlmere’s water still flows at six miles an hour through the pipes above the Sprint. Its regular, silent and hidden flow contrasts with the mercurial movement of the river, which sings and dances according to the weather. This point where waterways of such different character come into proximity seemed emblematic of the two aspects of the hydrosphere that we rely on, but often take for granted: the availability of drinking water, and the dependability of rivers. I thought back to the dry reservoirs I’d seen in July during my kayak journey along the Leeds and Liverpool Canal, and the stories I’d heard of how the infrastructure of this part of Cumbria is still recovering from the epic floods of 2015.